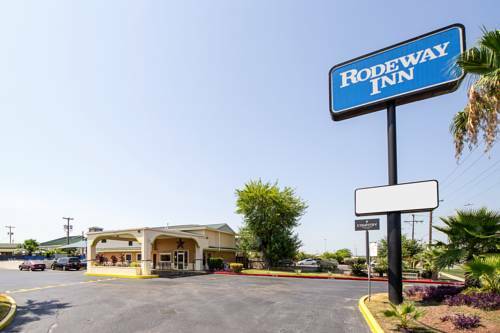 When all you need is a solid deal on a simple stay, the Rodeway Inn at Lackland AFB hotel in San Antonio is just what you are looking for. We're near attractions like Nelson W. Wolff Municipal Stadium, The Alamo, St. Mary's University and Six Flags Fiesta Texas. Enjoy amenities like free breakfast, a seasonal outdoor pool, business center and guest laundry facilities. Rooms include a coffee maker, desk, microwave, refrigerator, iron and board. Also, earn rewards including free nights and gift cards with our Choice Privileges Rewards program. 2.00 USD per room per night service fee collected at check in.